Following the last meeting of the ECB Governing Council on 22 October, Mario Draghi said that on Thursday, December 3rd, the Bank would review the orientation of its monetary policy in the light of economic and financial developments and the new Eurosystem staff forecasts, which will be disclosed at that time. The main issue facing the meeting is whether the ECB will take new steps to support activity. It could for instance announce further cuts in the deposit facility rate or an extension of quantitative easing (QE). Up to now the ECB has been careful to show its determination to meet its primary objective of price stability, even though in return it is encountering criticism that these waves of monetary expansion have had little effect on inflation but are fuelling asset price bubbles. With inflation at 0.1% in October, the ECB is far from meeting its goal of achieving inflation rates below but close to 2% over the medium term. While the low level of euro zone inflation is due in part to lower oil prices, the fact remains that, even when adjusted for energy and food components, so-called “headline inflation” has not exceeded 1% since September 2013, reflecting a persistent state of low inflation. Note that the figure for October is the last observed value of inflation and provides only imperfect information about how it is changing in the medium term. 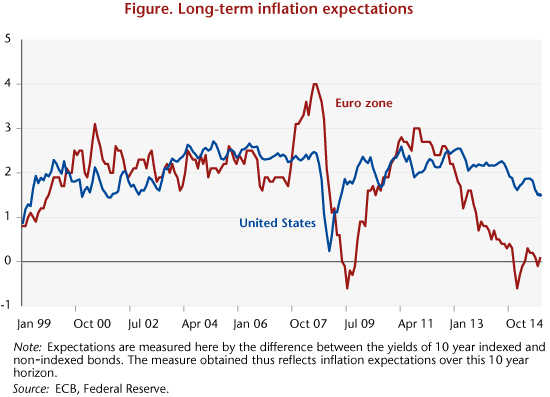 The central banks are thus particularly sensitive to changes in inflation expectations. Market indicators however point to a further decline in long-term inflation expectations, whereas these rose in January after the announcement of QE (see graphic). So while there has been only very gradual confirmation of a recovery in the euro zone, the fear of deflation has not abated, which should push the ECB to strengthen its support. In a previous analysis, which was based on quantitative easing programmes undertaken by the US Federal Reserve and the Bank of England, we emphasized the positive effects that QE was expected to have in the euro zone. The trends in euro exchange rates seen after the ECB’s announcements in January 2015 and at the October meeting suggest that there is an impact via exchange rate channels. Beyond these channels is the question of how QE affects asset prices. Several studies show that an expansionary monetary policy based on asset purchases supports financing and results in higher asset prices. However, some observers are also concerned about the risks associated with these operations, arguing that they feed asset price bubbles, that is to say, increases in prices that are not justified by economic fundamentals. Nevertheless, this kind of analysis relies solely on the rise in share prices to support these arguments. In a recently published study (Revue de l’OFCE, issue 144, November 2015, in French), we focus on the effects of monetary policy on three asset prices in the euro zone: the markets for equities, bonds and property. Our analysis suggests that monetary policy decisions would have no impact on asset prices that is not due to fundamentals. Thus, an interest rate cut does not seem to fuel bubbles, just as a tightening of monetary policy does not lead to a decline beyond what is indicated by the usual determinants of asset prices. While the channel of asset prices  does seem to be at work, monetary policy has no additional effects on the component of asset prices beyond what is due to economic fundamentals. This channel may be divided in two: Tobin’s Q channel and the channel of wealth effects. The first suggests that a reduction in interest rates is likely to have a favourable impact on share prices, since share prices correspond to the present value of future dividends. An increase like this in share prices lowers the cost of capital for businesses, and supports their investments (like traditional capital, but via a different mechanism, as higher share prices make share issues more attractive). The second suggests that household consumption may also benefit from lower interest rates: the increase in the prices of financial or property assets resulting from lower interest rates increases their total value and promotes consumption. In a model where households seek to smooth consumption over the life cycle, they spend more when their wealth rises.